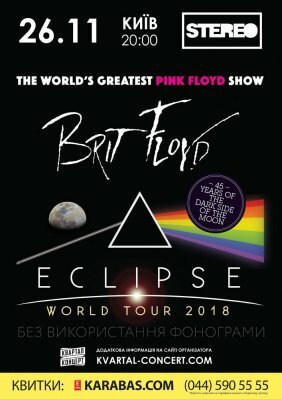 Brit Floyd, the world’s greatest Pink Floyd tribute show returns to the stage in 2018 for a very special '45th Anniversary' retrospective of Pink Floyd’s iconic 1973 album, The Dark Side of the Moon. Having sold in excess of 45 million copies and judged by many as the greatest rock album of all time, The Dark Side of the Moon was an ambitious psychedelic masterpiece that redefined rock itself and propelled Pink Floyd and its members to rock immortality. Each night Brit Floyd will perform classic tracks from The Dark Side of the Moon alongside gems from Wish You Were Here, Animals, The Wall and The Division Bell plus lots more. The Brit Floyd show has truly become a phenomenon, widely regarded as the world's greatest live tribute to Pink Floyd. Faithfully recreating the scale and pomp of the final 1994 Division Bell tour, complete with a stunning million dollar light show, large circle screen and arch plus moving lights, lasers, inflatables and theatrics. A Brit Floyd show really is as close as fans will get to experiencing the magnificence of a Pink Floyd show live. Brit Floyd is more than a tribute! It really is as good as they say - believe the hype and don’t miss it!